The Napoleonic Wars-Nonington and The East Kent Volunteers. In Nonington and The East Kent Volunteers, Nonington in the Wars, Nonington In The Wars! On February 1st.,1793, France declared war on Britain and Holland causing some alarm in southern England because of the closeness of the enemy. This caused the leading inhabitants of East Kent and Canterbury to call a meeting the following month where it was decided to form an association for the defence of East Kent and to raise ”volunteer Troops of Horse composed of gentlemen and yeoman and others willing to mount themselves on horses no less than 14.3 (hands) high and to clothe themselves at their own expense”. The East Kent division was to provide a troop or more with the troops to be named: Canterbury, Wingham, Elham, Ashford, Ospringe and Thanet. Over £.2,000.00 was raised immediately but in their patriotic fervour the association members, who included William Hammond of St. Alban’s Court, Nonington, overlooked the fact that the raising troops and appointing officers was in fact the sole responsibility of Parliament and the Crown. Accordingly Henry Dundas, the Secretary for War, declined the associations offer and subsequently the subscription contributions were returned to the donors. When France declared war Britain had a standing army of only some 40,000 or so men and Prime Minister William Pitt introduced legislation in March of 1794 to raise local defence “Volunteer Companies” to defend England, especially along the vulnerable Channel coast. In Kent the Lord Lieutenant called a meeting at Maidstone and the East Kent Yeomanry were formed. Yeomanry troop members were all local volunteers with the officers chosen from the local landed gentry. Troops consisted of a captain, who was the commanding officer, a lieutenant, a cornet, and about fifty troopers. The Yeomanry officers received temporary commissions from the Lord Lieutenant on behalf of the King and on 26th May, 1794, Sir Edward Knatchbull, Sir John Honywood, William Hammond of Nonington, and Henry Oxenden of Wingham were all given captains commissions in The East Kent Yeomanry, whose chosen motto was “Liberty, Loyalty and Property”, and were appointed commanding officers of their respective troops. Nonington had raised two Yeomanry troops, the 1st. Nonington under Captain Hammond and the 2nd. Nonington under Captain Taylor. The two troops numbered some 105 men from Nonington and nearby parishes. In July of 1794 Captain Hammond was one of the East Kent Yeomanry officers presented to King George III. So a French invasion via Sandwich in late 1796 would have meant Major Hammond and the two Nonington troops literally fighting to defend their homes and families if Nonington had been the place where British defending troops engaged the French. The threat of invasion was for a time taken very seriously by the British government and the south-coast of England was heavily fortified as a precaution. Plans were also made for the evacuation of civilians in the event of a French invasion, a copy of the plans for the evacuation of Nonington’s inhabitants has recently come to light. 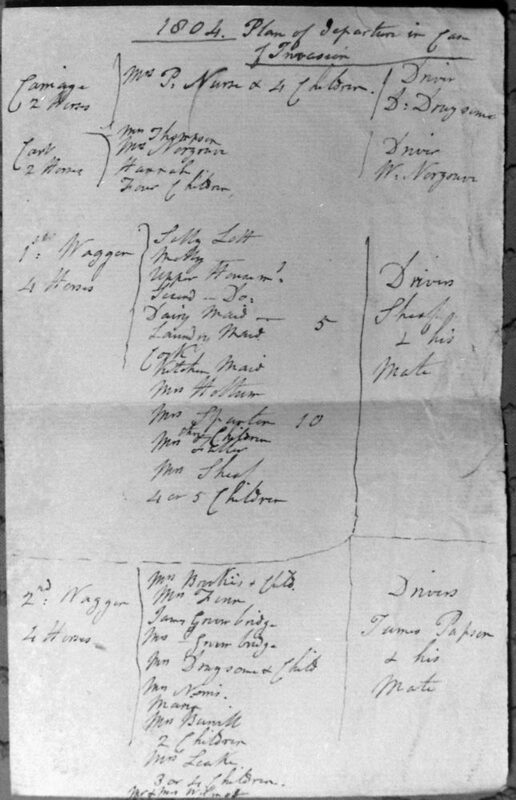 The list shows mainly women and children, presumably the men were to stay behind and assist the Nonington Yeomanry and other troops to fight the French invaders. The second oldest alehouse in the old parish of Nonington was “The Redd Lyon”, later “The Red Lion”, at Frogham which is a hamlet some mile and a half or so as the crow flies to the south of St. Mary’s Church. Some of the old alehouse out-buildings still stand on the north side of the Barfreston to Womenswold road about one hundred yards to the west of the junction with Frogham Street. The old alehouse yard entrance has a large yew tree, probably much older than the alehouse, on its western side next to which are the remains of the main alehouse building which now just consist of a section of brick wall enclosing an external door-way with a metal grilled cellar window next to it. The ariel photograph below, taken around 1940, shows the ale-house was built at an angle to the road and the brick out-buildings were at a right angle to the main building so forming an ‘L’ shape. In the yard in front of the buildings was a deep well still in use into the 1950′s but but now capped and covered. 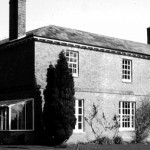 In 1959 main ale-house building, by then converted into cottages, was demolished in 1959. 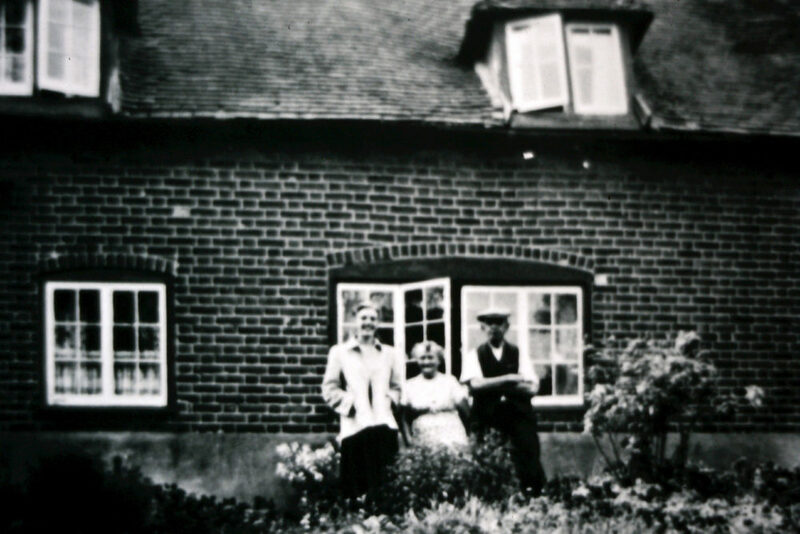 The picture below of the old ale-house building is believed to date from the 1930’s, by which time it had been known as “Phoenix Cottages” for some fifty years or more. It shows a substantial brick building which appears to date from the late 1600’s or early 1700’s. The building was most likely built as a farmhouse with “The Redd Lyon” alehouse as a side-line run by the farmer’s wife and occupying one or two rooms on the ground floor closest to the road and initially the wife would have brewed the beer sold on the premises. The remnants of a gable end wall with a cellar door and window can still be seen in the road bank. The elderly couple in the photo are Mr. and Mrs. Jarvis, possibly with their daughter. The widowed Mrs. Jarvis moved to Holt Street Row with her grand-son, Colin, when the cottages were demolished in 1959. Opposite the yard entrance the bank has been cut back to widen the road to allow large horse drawn vehicles to swing easily into the yard from either direction and the remains of a flint wall built to retain and strengthen the bank to prevent its collapse are still clearly visible, but now in a sad state of disrepair. The first victuallers licence was granted to Abraham Dunne at the Wingham Petty Sessions on June 15th, 1725. Abraham was the licencee until 1729 when Thomas Wraight took over him and ran the alehouse until 1736 when he was succeeded by Thomas White. In 1744 Thomas Gambole, whose surname was spelt variously: Gambrole, Gambrill, Gamboll or Gambole in assorted documents, began a long family association with The Redd Lyon. Thomas was succeeded in 1782 by his son, John, and after his death his wife took over the licence in her own right as the “Widow Gambrele” in 1788. 1820. John Hopper was the land-lord under whose tenure The Red Lion was renamed The Phoenix in 1833. 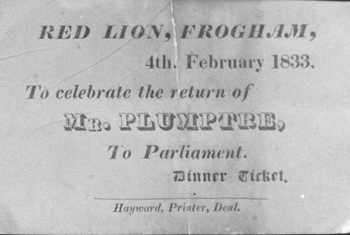 In December of 1832 John Pemberton Plumptre of Fredville, who owned The Red Lion, was elected to Parliament as one of the two Eastern Kent M.P’s., the other being Sir Edward Knatchbull, Bt. A celebration dinner was held at The Red Lion on February 4th, 1833. The election success is most likely the reason for the ale-house being renamed The Phoenix as the Plumptre family coat of arms had a phoenix crest. J.P. Plumptre served as an M.P. from December 1832 until January, 1852. 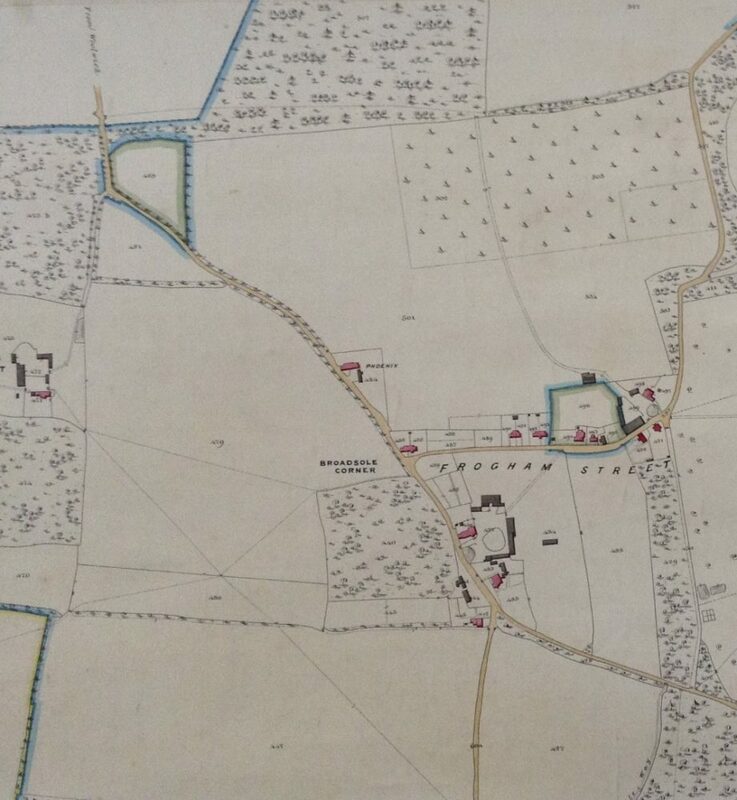 However, the 1839 parish tithe map still recorded the newly named ale-house as The Redd Lyon as information for the map was taken from existing and often out-dated land owners records and not from a full survey as with the 1859 tithe map. The 1839 parish tithe map records the field directly across the road from the old alehouse as Lyon Field, and the field at the rear as North Lyon Field. By the time of the 1859 parish map was surveyed and drawn had become North Lyon Field had become Phoenix Field, Lyon Field still retained its pre-1839 name. 1836. William Burville. Licences were normally renewed & new ones issued at the Wingham Division Licencing sessions in September but John Hopper’s licence was transferred to William Burville on November 1st 1836 indicating something must have suddenly happened to him. 1851. Anne Holloway, wife of William. 1855. Edward Allen. It was during Allen’s tenure that the London, Chatham and Dover Railway line to Dover came through the parish, reaching Dover Town, now Dover Priory, station in July 1861. The line is only a couple of hundred yards up the road from the old alehouse which would have obviously benefited from the dozens of thirsty railway navvies employed in its laying. Indeed, a dozen or so of these navvies, mainly single men, were listed in the 1861 census as lodging in the alehouse, by then under the tenancy of George Webb, whilst others stayed with households near to the railways route through the parish from the hamlet of Ratling in the west to The Phoenix at Frogham in the east. The 1861 census also records some navvies and their families living on nearby West Court Down, to the south-west of the alehouse, probably in a shanty town of tents and temporary huts . 1870 Mrs. Sarah Webb, George’s widow, was licencee. 1871. Henry Bates and his wife, Francis, and their five children. 1875. George Colthrup, son of Edwin. In 1883 The Phoenix closed its doors as an alehouse and the main building was converted into two cottages known as Phoenix Cottages which were demolished in 1959.